Bindhu Krishna, Kerala politician Attingal 2014 UDF candidate profile and biography is given here. Bindhu Krishna who started her political journey with student's politics has risen to the position of Mahila Congress President. Bindhu who practiced as an advocate in Kollam bar has been in front giving leadership to the Mahila Congress and empowering women. Read more to know about Bindhu Krishna. Bindhu Krishna was born at Kattachal Sauparnika as the daughter of Sukumaran and Sumathiamma. Bindhu who was deeply interested with politics, joined the Kerala Students Union (KSU) which latest proved to be the stepping stone for her career in social work. In 1987, during her studies at NSS Women's College Kollam, smt. Bindhu Krishna became a member of KSU. For her active presence in the students union, Bindhu was lifted up as the unit president. 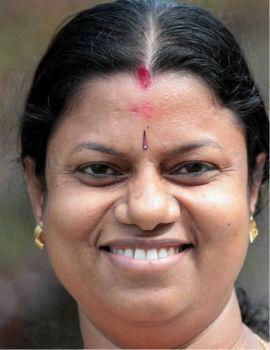 Being a dynamic leader, Bindhu was elected to the KSU Kerala state committee in 1993. After completing her Bachelor's Degree in Law from Thiruvanathpuram Law Academy, Bindhu practiced as an advocate in Kollam bar. Even while giving much importance to her profession, Bindhu Krishna was genuinely involved in serving the public. For a decade, Bindhu spread her wings and become much popular among the member of the Kerala Students Union. In 2004, Bindhu Krishna followed K Karunakaran to join the Democratic Indira Congress (DIC). Young and energetic Bindhu was appointed as the state president of Nationalist Youth Congress. She was one among the women leaders who was given ample opportunity to mount up in the political field. After 3 years of working with DIC and NYC, Bindhu returned back to Congress in 2007. For her hard work and consistent effort in politics, Bindhu Krishna was appointed as the General Secretary of the Mahila Congress. In 2008, Bindhu was chosen as the general secretary of the DDC which really added a golden feather in her cap. Bindhu Krishna has held some of the top positions including the Vice President, All India Mahila Congress President, Kerala Pradesh Mahila Congress Committee Executive (Governing body) Member, Kudumbasree Mission. Kerala State President, Kerala Pradesh Asha Workers Congress (INTUC) President, Kerala State School Council Association State President, Pre-primary teachers and Aayas Association. As the Vice President of the National Mahila Congress, Bindhu has good relationship with Soniya Gandhi and Rahul Gandhi. She is well supported by her husband Adv Krishnakumar, who is also a politician who is also a strong supporter of the Congress. As an orator and an individual with bouncing personality, Bindhu contested from the Chathanoor legislative assembly constituency. The young politician has shown her determination giving leadership to the Mahila Congress and also empowering women. In 2014, Bindu Krishna will contest the election from Attingal giving a tough competition to his arch rivals who represent the LDF, BJP and AAP.